Last weekend, we cautioned you against speaking ill of others while using popular microblogging Twitter. Our cautionary tale featured rocker, actress, and famous-for-her-outbursts personality Courtney Love. She is being sued by Austin fashion designer Dawn Simorangkir (aka Boudoir Queen), for calling her â€œnasty lying hosebag thiefâ€ and a drug addict and a prostitute. 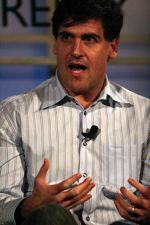 Today’s sobering example features Web startup zillionaire and Dallas Mavericks owner Mark Cuban. Cuban is being fined $25,000 for trash talking on Twitter. He was said to be “criticizing the referees and some of the calls, and lack of calls that were or were not made,” during last Fridayâ€™s NBA game against the Denver Nuggets. The only instances we’ve seen, so far, of fines, or legal action, resulting from offhand criticism vented on Twitter, have involved famous people. So far. Is it just a matter of time before the trickle-down economics of social media reach non-famous people, and run-of-the-mill folks will start getting sued or fined for ill-considered Tweets? What expectations should we (and our employers, our neighbors, et al) have for users’ remarks on Twitter? What behavioral code should we set for ourselves?